The Kyeamba Valley Landcare group is a community volunteer organisation that was formed in 1989 by a group of Kyeamba Valley landholders with a common concern about the protection of our natural resources. 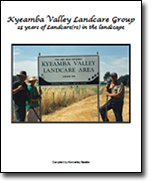 Kyeamba Valley Landcare Group: 25 Years of Landcare(rs) in the landscape. Kyeamba Valley was one of the first Landcare groups to establish in NSW and now has a membership of around 100 rural landholders, including some of those members who remain active volunteers of our group today. Our activities are concentrated in the Kyeamba Creek Valley, and are of around 100,000 hectares. The valley parallels the Tumbarumba Rd, from the Sturt Highway junction near Ladysmith to the Hume Highway Junction 40km east. The valley incorporates the communities of Kyeamba. Gregadoo, Big Springs, Book Book, Ladysmith, Coreinbob and Borambola. The group was initially formed in response to the emergence of land degradation problems in the Valley, such as salinity, soil acidity and erosion and the desire to address these problems. We are a community-based organisation that operates as an incorporated body administered by a Chairman and a Committee of six elected by the members at our AGM in May each year. The community vision for the Kyeamba Valley Landcare Group is "working toward a better future". Through education, participation and community ownership we are aiming to achieve a viable, sustainable and productive environment through a planned approach to the rehabilitation of degraded land, water and vegetation and the implementation of more sustainable land use practices. We have completed more than 60 major environmental projects on both privately and publicly owned land in the Kyeamba Valley. This has led to significant improvements in water quality, salinity, biodiversity and soil health and will be a legacy for future generations. Through field days, forums, guest presenters, training courses and social functions, the KVLG has provided opportunities for participants to increase their awareness and understanding of a variety of topics including environmental, farming, business, health and community issues. The group has helped local farmers understand and embrace sustainable agricultural practices leading to increased farm profitability. Successful, profitable farm result in progressive rural communities who are more confident about making decisions about their future and who are equipped to adapt to a changing environment.